Deng Boqing, vice-chairman of the China International Development Cooperation Agency (CIDCA), led a delegation of Chinese government international development cooperation officials to Dominica from Oct 24 to 26. Deng Boqing, vice-chairman of the China International Development Cooperation Agency (CIDCA), attended the opening ceremony of the China-EU International Development Cooperation Forum on Nov 15. Wang Xiaotao, chairman of the China International Development Cooperation Agency (CIDCA), met with EU Commissioner for International Cooperation and Development Neven Mimica on Nov 14. Zhou Liujun, vice-chairman of the China International Development Cooperation Agency (CIDCA), led a delegation to Malawi from Nov 13 to 15. Zhou Liujun, vice-chairman of the China International Development Cooperation Agency (CIDCA), led a delegation to Namibia from Nov 7 to 9. Zhou Liujun, vice-chairman of the China International Development Cooperation Agency (CIDCA), led a delegation to Botswana from Nov 10 to 12. 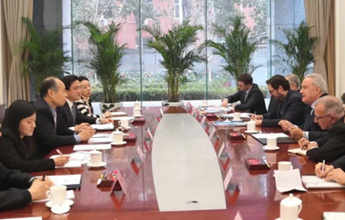 Deng Boqing, vice-chairman of the China International Development Cooperation Agency (CIDCA), met with Assistant Administrator of the United Nations Development Programme (UNDP) Abdoulaye Mar Dieye at the United Nations Headquarters in New York on Oct 29. The two sides exchanged views on issues such as strengthening international development cooperation. The China International Development Cooperation Agency (CIDCA) and the United Nations Development Program (UNDP) jointly held a release ceremony for a report on case studies of China's aid projects to African agriculture at the United Nations Headquarters in New York on Oct 29. Copyright © China International Development Cooperation Agency. All rights reserved. Presented by China Daily.